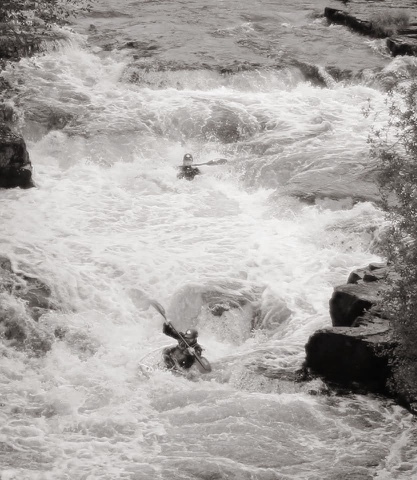 WALLACING ALL THAT HOLDS HER BACK ~ The incredibly brave story of Mayo and CAN U KAYAK? 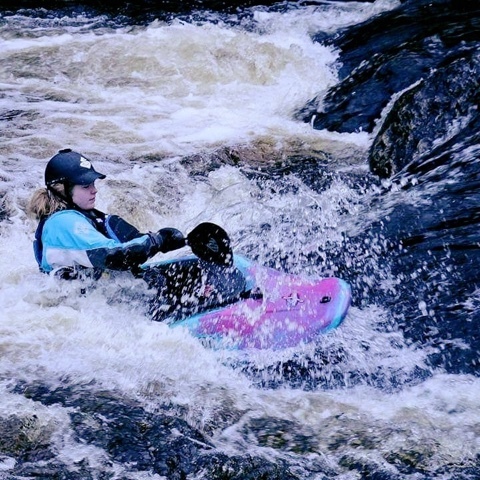 by Angela Cross | DBP MAGAZINE ONLINE The World's Best Free Whitewater Publication. Maya-Ray Cross, simply Mayo to her friends, is 14 years old (she will be 15 on April 12th), hailing from the UK. 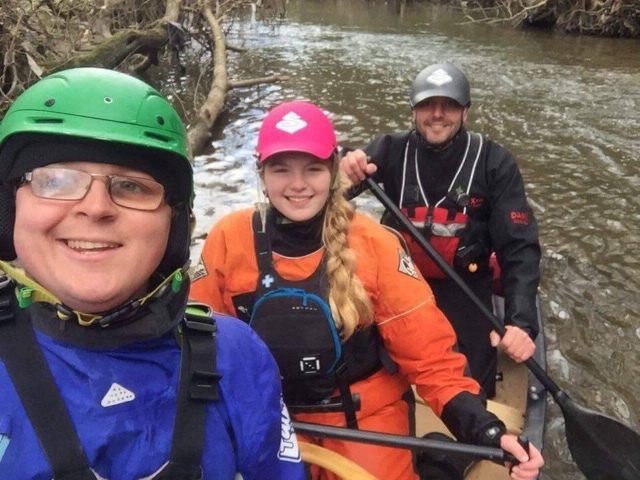 She has been paddling from the age of seven, starting out on a lake, and has moved on to whitewater. Mayo has chronic pain because of Ehlers Danlos Syndrome, a genetic condition that affects the collagen, in some cases all through the body. It can cause dislocations and subluxations of joints. Mayo dislocates shoulders, knee caps, fingers, thumbs, wrists, toes, and her hips are dodgy too. She finds walking painful and difficult as she falls lots. She is constantly covered in bruises due to her condition, which at times are very painful. She paddles as much as possible. Often she is in lots of pain, but Mayo says what she gets from paddling is worth the pain and injuries that she has to endure. She is Home Educated due to her condition and inability to lead a normal school life. 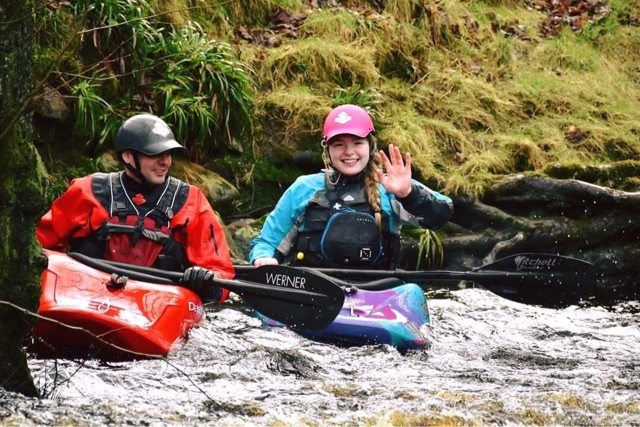 Her social life revolves around paddling; that’s where most of her friends are. Doctors are investigating her chronic stomach pains at the minute by putting her on a liquid diet, fed via a nasogastric tube. She is still paddling with this in. 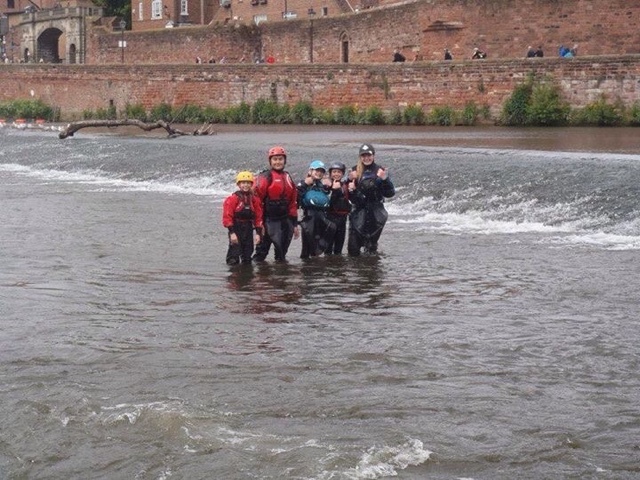 She got out of hospital Wednesday, paddled in a pool Thursday, then on a grade 4 river (the Tryweryn) Friday. Her favourite boat so far is her Jackson Rockstar, and she’s currently looking for a riverboat. Mayo wants to train as a coach as soon as she is able; she helps out at several clubs and is a inspiration to the younger members. She already holds 2 BCU 3* awards one for Open Canoe the other for Whitewater. She wants to do the 3* Freestyle award next. Mayo wants to do freestyle competitions in the future, starting with Young Guns, and she is currently working on her loop. It may have to be put on hold though until the feeding tube is gone!! However, she is attending the Young Guns this year if only to gain the experience. EDITOR’S NOTE: We are stoked to call Mayo one of us, a true dirtbag paddler! 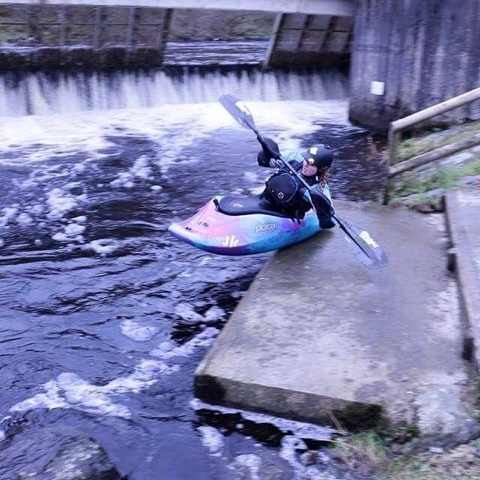 Her story and her passion is amazing, her dedication to the sport is complete, and the love that flows through her via The River and its people is an inspiration to us all, paddlers or not. Look for our upcoming interview with the birthday girl, coming soon in DBP MAGAZINE ONLINE! Go Girl- a true inspiration. 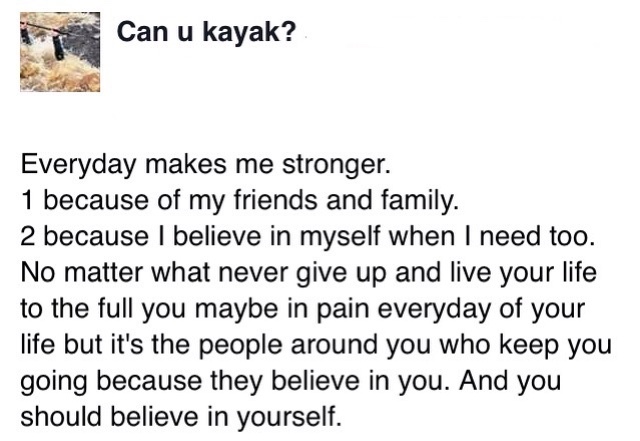 I am overwhelmed at the support given within the kayaking community. It goes to show that even with disabilities, anyone can have fun. Mayo is an inspiration to us and even though this is a life ling battle it is one she will always win. Sure there are days that she is overcome by this condition, but she gets right back up and soldiers on. I'm proud to be her dad.